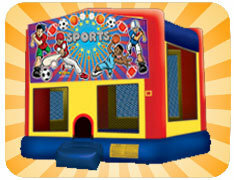 Our brightly colored Sports bounce house features colorful graphis of Soccer, Baseball, Football and Basketball players. It is a perfect addition to your little athlete's party! It features a large 15 foot by 15 foot jumping surface which is larger than the jumping surface found in our regular bounce houses. Base price is for a rental period up to 4 hours in length. Additional hours can be added at $25.00 per hour. Delivery is free within 15 miles of our location, each way. Each additional mile is 75 cents a mile each way. Our Sports Themed Bounce House is a hit at any event! This bounce house is 15 feet wide by 15 feet deep and is 13 feet high. One attended is required to monitor play while children are playing. This attendant can be someone that you provide, or Parties Inc. can provide an attendant at an additional cost. This bounce house can be set up on grass, a drive way, school black top, or inside a gym. A set up area of 19 feet wide by 21 feet deep by 13 feet high is required. A regular 15 amp circuit is equired with nothing else running on it. Normally, your back yard outlet will work fine! The bounce house must be plugged into the power source at all times during operation. For instances where power is not available, we have generators available for rental.